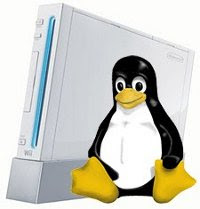 Installing and Running Linux on Nintendo Wii: We've shown you that installing and running Linux on Sony PS3 is possible and is not that difficult to accomplish. This time, we will share to you an overview of installing and running Linux on another popular game console, the Nintendo Wii. The Linux kernel has been ported to the older Nintendo GameCube console, but the features were very limited due to hardware constraints. On Wii, Linux can be a quite usable and has a lot of room to grow since it has a powerful processor, USB ports, SD card slot, and Bluetooth among others. Wii-Linux is a port of the Linux kernel and related GNU userspace utilities that can be loaded to the Nintendo Wii via the Twilight Hack, bootmii, or the Homebrew Channel. The kernel can communicate and supports nearly all the Wii peripherals including the Remote, Wi-Fi, USB, Bluetooth, and the DVD drive. There are quite a few Linux distributions available for the Nintendo Wii. Among others, there's the Gentoo-based WiiToo!, Archi-based Archii, and Debian-based Whiite. Perhaps the most popular among the three is Whiite-linux because of its easy-to-use GUI installer. The Whiite-linux installer is a special gc-linux kernel image that can be used to prepare and install a Whiite-linux system into a compatible SD card using the Nintendo Wii video console. The full instructions of installing Whiite on the Nintendo Wii can be found HERE. After installation, you can go HERE for instructions on using Linux on the Nintendo Wii. How abou OpenElec on the wii ??? Is it possible to put it on the wii now that it has been ported to Debain?? ?